The Arlberg is a high mountain pass (1,793 metres) in the West of Austria, near the border to Switzerland. It separates the Western province of Vorarlberg (the name means "In front of Arlberg") from Tyrol and the rest of the country. For centuries, the Arlberg was an difficult obstacle for trade routs and travelling; today, it is in the centre of Austria′s best and most exclusive skiing areas. If you happen to be Austrian and the descendant of some poor peasant family that has starved on the Arlberg′s infertile soils for the past centuries - you are very lucky! Chances are good that you own a chunk of land in one of only a handful of communities that concentrate a significant share of the country′s tourism business and wealth in what used to be more or less a desert a century ago. Former farmers have now turned to seriously rich hotel owners and communities like Lech or St. Christoph generate a wealth that is unrivalled in Austria - and beyond only by the Swiss St. Moritz, which plays in the same league. Not all, but most hotels in the Arlberg region serve a high-end clientele. Many of them are shockingly cheap or even closed during the short summer season - hiking is popular at Mount Arlberg, but nothing compared to the skiing season. 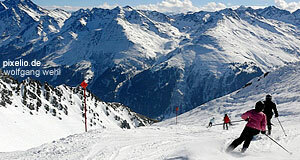 The Towns of the Arlberg Area: Austrian Skiing at its Best! Here on TourMyCountry.com, I have put together individual guides to the most important communities and ski resorts on Mount Arlberg: The "chief community" of St. Anton (where skiing was introduced to the Alps), the very posh and exclusive communities of Lech, Zürs and Klösterle; the luxury climax of St. Christoph and Stuben; or the somewhat off-mainstream and family oriented Pettneu. This article is meant to put a framework to the individual towns of the Arlberg area. Most of these towns call themselves "X am Arlberg" ("X on Mount Arlberg") to emphasise that they really are part of this region. Skiing areas like the "White Circle" ("Weißer Ring") between the smaller peaks of Gampen, Kapall, Galzig and Valluga around St. Anton and St. Christoph or the Albona area of Stuben, or the Rendl of St. Anton have created an almost legendary reputation for the region. In 2002, the record-setting mark of one million over-night stays was reached. The "re-invention" of the hiking holiday, enhanced with free climbing, paragliding, mountain biking and other "cool" sports, certainly helped - up to the 1980ies, almost all hotels of the Arlberg region closed for the entire summer.